Versatile and talented senior will contribute in both the 400 and 400 hurdles, as well as a the 4×400 relay…outstanding student who earned All-ACC Academic honors in 2013. Outdoor: Personal highlight of the season came at the ACC Championships, where she placed sixth in the 400-meter hurdles, helping the Seminoles to a runner-up team finish…a regular contributor on the 4×400 relay which recorded a season-best time of 3:38.42 at the Seminole Invitational…was a member of the NCAA East Preliminary 4×400 relay team, which finished 20th. Indoor: Member of FSU’s ACC Championship runner-up 4×400 relay team, which turned in a season-best time (3:40.07) to help the Seminoles secure a runner-up team finish…registered a personal-best 400-meter dash (57.21) at the Razorback Invitational. Outdoor: Placed sixth at the ACC Championships in the 400 hurdles (1:01.27) after qualifying eighth, earning her first individual conference championship points…registered her career-best time in the 400 hurdles (1:00.80) with a third-place finish at the FSU Relays…also contributed to Seminoles’ 4×400 relay throughout the year. Indoor: Made tremendous strides throughout the season in both in the 400 and as a member of the 4×400 relay…anchored the 4×400 unit to a fifth-place finish at the ACC Indoor Championships with a 56.1 split as the ‘Noles preserved a second-place team finish. 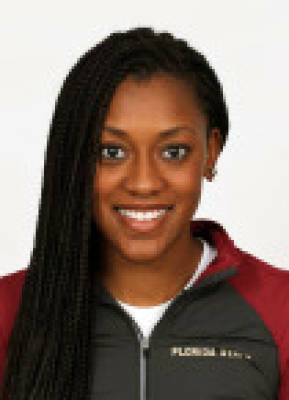 Outdoor: Competed in the 400m hurdles at the ACC Outdoor Championships…season-best time in 400 hurdles (1:02.60) came at FSU Relays where she finished fifth…was a member of the winning 4×400 relay at Seminole Invitational and UNF Spring Break Invitational. Indoor: Competed in three meets during the season, each time in the 400m dash. An outstanding student-athlete who aspires to be a pediatrician and will apply to medical school after earning her exercise science degree from Florida State…starred at Archbishop McCarthy High in Fort Lauderdale…finished third in the 2010 2A state meet in the 300m hurdles…ran cross country in high school to prepare for track season and participated in a pair of state championship meets…born Dec. 25, 1992.